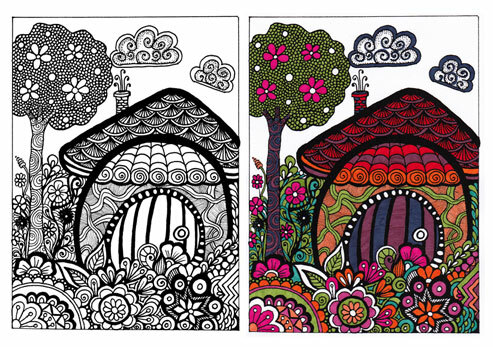 Forest house free coloring page. This started out as a random doodle that grew into a whimsical house surrounded by greenery. I colored it in with Faber-Castel Pitt Artist Brush Pens, which are great for coloring small intricate details but also get a good coverage for larger spaces. Download the free coloring page in PDF format here, print it and enjoy! Zentangle leaf #2. 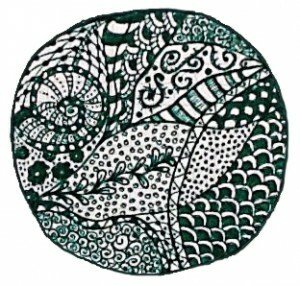 The pen is Faber-Castell PITT artist pen F.
Here’s a tutorial on how to draw a leaf zentangle style. I’m planning a whole series of videos with ideas on various types of flowers, leaves and trees called “Nature Zentangles” and this is the first one. You can find all my tutorial videos on my YouTube channel.